When heading to Disney World who knew one of the most magical moments would be not having to use any of the following: ID, credit card, debit card, cash, or wallet to purchase anything, anywhere. Disney launched their “magic bands” late in 2013 - and at first glance it seemed like a theme park enhancement. A way to get on rides easier, to verify your tickets, etc… But the killer feature was living the week without a wallet. I’m always interested in new payment methods, I’ve tried square, paypal - I use my starbucks app for every ice-tea purchase, but I haven’t seen anything that “just works” like this. And at scale, with 17 million people entering just Disney World's Magic Kingdom each year. The bands are a water-proof and unobtrusive - a wearable that never needs to come off. It holds a RFID chip that holds all your information. 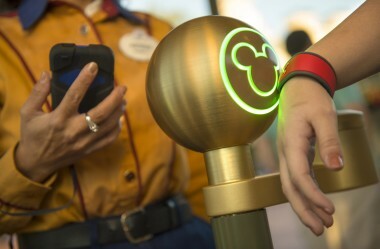 That with a 4 digit pin number, and you’re set for anything needed at any Disney park or even Downtown Disney shopping area. They worked perfectly every time, and they had a great experience with just the right visual feedback. All you do is tap your band to the reader, wait for the light, put in your PIN, and that’s it. They were still handing out paper receipts which seemed odd - why not send a digital receipt with a daily breakdown of expenditures and categories. I bet I spent $100 a day on food, they should have been gameifying me to upgrade to their meal plan - I sure they have the data to tell that story. It was also perfect for people who don’t like to carry anything. I always have a small bag when traveling, so it’s not a big deal, but my wife doesn’t want to carry anything, ever (women’s pants don’t have pockets!). So it worked perfectly for her. When we went to Downtown Disney (the shopping area, with non-Disney vendors) we split up. I got a text “I forgot I don’t have any money” - I just told her to use the band we were still wearing. Even non-Disney vendors had their POS converted to work with the bands. For me, and someone who has tried numerous ways of paying for things at conferences like SXSW, this was the first time it was truly easy and seamless. Kudos to the team that pushed that through and launched at that scale. And I almost forgot, they open your hotel room door as well. "Imagine going into a Starbucks and just touching your iWatch or iBand to the terminal, entering a PIN number and it is charged to your Apple account...Yes, you can do this with an iPhone now but that means taking it out of your pocket or purse and it is only single authentication at present. In a wearable, it is much easier to use for entering the home and for all types of interactions and transactions." Now let’s see this implemented outside of the Magic Kingdom, so we can all leave our wallets at home. 1.2 billion watches can't be wrong - where does a smart watch go when you own a Rolex?